Virginia Joplin was living in France when she decided she wanted to become a translator. She did translation for multiple corporations before starting as a freelance translator in 1996. 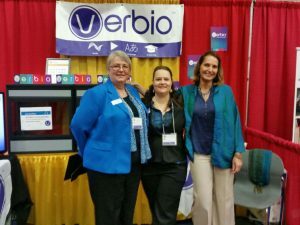 Now, Virginia’s Portland-based company, Verbio, has more than 500 corporate and government partners. Verbio offers language translation services for business, marketing, financial, legal and technical content in every language. After landing a corporate customer in 2009 that needed translation services in sixteen different languages, Virginia realized she needed to start hiring employees. She now has eight full-time employees and dozens of independent contractors. Virginia went to the SBDC in 2013 for help in marketing her business. She took a marketing basics class and the Advanced Small Business Management course. She also started working with an adviser, who helped her apply for a State Trade and Export Promotion (STEP) Grant. Her adviser also helped her find the right sales metrics tool for Verbio.